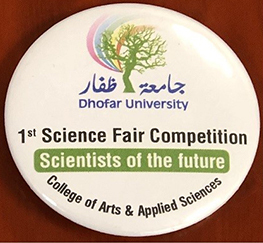 The Department of Mathematics and Sciences, Dhofar University conducted the first High School Science Fair Competition on 8 April 2019. It was a unique event to identify and recognize the science talent among the high school students. Based on the overwhelming response, it is decided to carry out this competition annually. It was held under the joint patronage of Dr. Muhammad Asif Gondal, the Chair Department of Mathematics and Sciences and Dr. Khalid Muslem Al Mashikhi, the Dean of the College of Arts and Applied Sciences. It is to be recalled that the Department of Mathematics started the Annual High School Mathematics Competition and has conducted it twice on 25 March 2018 and 5 December 2018 respectively. The main goal of the science fair is to encourage creative scientific thinking, engage students of all levels and provide an opportunity for friendly competition among students and schools. Schools were sent invitations to send their science projects comprising of teams of up to four students along with one or two supervisors. The science fair had twenty-eight projects from seven schools. There was a strong representation from girl students. The event was inaugurated in a Ribbon Cutting Ceremony by the Chief Guest, Dr. Khalid Muslem Al Mashikhi, the Dean of the College of Arts and Applied Sciences in the presence of Dr. Syed Ahsan Jamil the Dean of College of Commerce and Business Administration and Dr. Lotfi El-Mashichi, the Dean of College of Law along with various heads of Departments. The half day event had several items as follows. The teams were welcomed along with their supervisors. The teams were assisted in exhibiting their projects in the five laboratories for one domain each: biology, chemistry, computers, mathematics and physics. Along with the project exhibition, the participants had a tour of the College of Engineering and had a glimpse of the laboratory/workshop equipment. All the projects distributed in five domains were graded by a panel of two judges each. The judging involved the posters/write-up of the project, the demonstration of the project and the oral questions asked by the judges. The average marks of the two judges was used for the ranking of the projects in each domain. The ranking of the participating schools was decided based on the totals they received. The first, second and third positions were taken by Pakistan School Salalah, Al-Sadah School for Girls and Salalah International School respectively. The event was spearheaded by the tireless efforts of Dr. Raed and his team comprising of all memebers of the Department: Dr. Khedr Abo Hassan, Dr. Inayatur Rehman, Dr. Taoufik Ben Jabeur, Dr. Sabir Ali Siddiqui, Dr. Gowhar Ahmed Naikoo, Dr. Mohammad Ali Al-Amri, Dr. Musallam Tabook, Mr. Saeed Al-Kathiri, Dr. Lukmanul Hakkim Faruck, Mr. Mohammed Tabidi, Dr. Eihab Bashier Mohammed Bashier and Dr. Sameen Ahmed Khan, under the visionary supervision of Dr. Muhammad Asif Gondal the Chair of the Department. The three trainees in chemistry and one in physics assisssted enthusiastically. The event constantly enjoyed the diligent support of the department’s secretary Hajer Ali Mohammed Shanfari and the college’s secretaries, Nawal Salim Mohammed Al Khaldi and Noor Al Qamar Amer Jeed. The enthusiastic support by the student volunteers is a hallmark of the Dhofar University tradition. The participants and visitors were served refreshments. There was a closing ceremony at the end of the Science Fair. It was graced by Mr. Jamal Mohammed Al Balushi from Methanol Company. He made an excellent presentation on the company. Mr. Jamal had a close look at the various projects and was very impressed by the projects and the overall conduction of the science fair. Methanol Company was the generous sponsor of the science fair. Dr. Khalid Muslem Al Mashikhi, the Dean of the College of Arts and Applied Sciences also spoke briefly. Mr. Jamal was presented a plaque by Dr. Khalid as a token of appreciation. All the participants were given a certificate of participation. The top three projects in each domain were awarded with a certificate and a gift. The top three schools were also given a shield each. The winners were given prizes (tablets, computer printers, USB and other computer accessories, generously sponsored by the Methanol Company). All the judges were also provided a certificate. All the participants and visitors were provided a badge specially made for the event. Dr. Sameen Ahmed Khan, one of the staff members distributed a set of popular articles authored by him on mathematics, science and environment.